No one could really question whether the checked blazer is on its way out or not (it isn't—it's still selling like crazy). But there's certainly some stiff competition coming in thanks to a new, casual hybrid of a jacket in town. Part safari, part military, part tailored, almost always belted and rendered in any colour you want (although tan leather seems to be the trending option), this patch-pocketed number is notching up fans left, right and centre. Two particular styles from the high street have been most triumphant in their reach on social media: Influencers have been having the tough time of choosing between H&M's slightly '70s belted style and Massimo Dutti's slightly slimmer camel version. As usual, Ganni—and a host of Scandi girls—could be credited with kick-starting the movement when it introduced belted leather jackets last year. Although the black version kindly reminded us that Gwyneth Paltrow had a great wardrobe in Sliding Doors, it was the more colourful versions that attracted the street style crowds—candy pink is the current frontrunner. Most of all though, this spring jacket offers you great flexibility in an uncertain patch of poor weather: Cold and rainy? Layer up and belt it to still define your waist over jeans, trousers or a floaty skirt. Going to a festival? This is the cover-up to choose. Feeling hot after a brisk walk? Unbutton, unbelt and treat it more as a thrown-on lightweight shacket. Keep scrolling to see this jacket trend in action and shop the best ones for yourself. If even a Parisian icon is switching up their classic jacket selection, you know it's important. Jeanne's is from Massimo Dutti. Claire Beermann styles the Insta-famous H&M jacket in a more retro way with her printed mini and knee boots. Marie Jedig is the girl we turn to when we want new colour combinations, so this minty number (alongside lemon yellow and pastel pink) lives up to expectations. Pelin Guel snapped up the H&M version before many of us and is wisely styling it out on a cold day with a white roll-neck. Blanca Miro picked up Ganni's leather number in baby blue—and boldly clashed it with her vibrant collection of accessories. 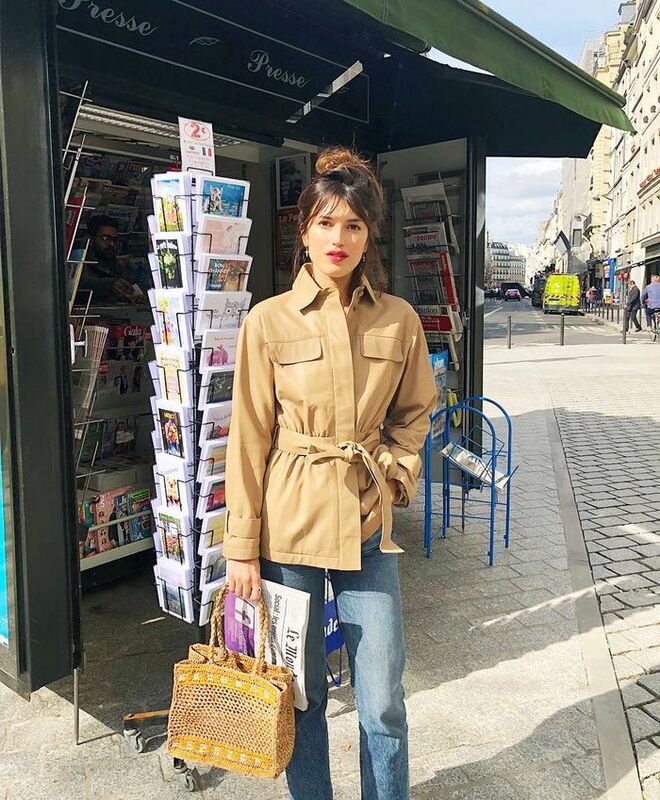 Proving that a statement spring jacket needn't feel OTT, Alexis Foreman of Style Memos added hers to a neutral, tailored get-up we'll be copying for work next week. Enjoying the upturned collar here. This is from the brand's premium line, hence the price. & Other Stories has created the most wearable weekend version. Yves Saint Laurent was the designer who really put safari jackets on the fashion map in the 1970s. There's nothing subtle about this. Cargo jacket with a twist. Why not in denim? This style is coming soon. Great for larger busts thanks to its flattering V neckline. April showers, we're ready for you.